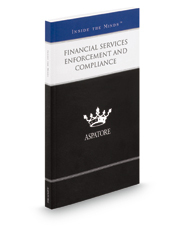 Financial Services Enforcement and Compliance provides an authoritative, insider's perspective on navigating recent developments in the financial services industry. Experienced partners from law firms across the nation discuss the financial requirements of various industries and compare U.S. market activity with global markets. These top lawyers offer insight on monitoring SEC trends, handling investigations, and educating clients about the penalties for noncompliance. Covering topics that range from analyzing the effects of the Dodd-Frank Act to understanding the nuances of industry-specific regulations, these experts offer best practices for overcoming challenges presented by the changing financial services industry. The different niches represented and the breadth of perspectives presented enable readers to get inside some of the great legal minds of today, as these experienced lawyers offer up their thoughts on the keys to success within this dynamic legal field.